I’m currently full-time traveling by flying everywhere while my car is parked in a snow bank in Alaska. When I fly into a new destination I either call on Uber or Lyft to get me where I need to go. When I’m in locations where my family or friends are they usually will pick me up. I do work with car manufacturers and have had Mitsubishi, Kia, and Nissan hook me up with cars this year to review. More often than not though, I need a rental car. For most people this is an easy task, they jump onto Kayak or Expedia and put a car on hold. Well, I used to do that and thought finding rates that were $25-40 a day was a good deal. I don’t have a credit card and pay for all of my travels with cash and my trusty debit card. Did you know that when you use your debit card, that companies will place an additional $100-350 hold on your card? Guess when they release those funds? The tiny print says it can take up to 21 days! Also, a little known fact is in some states (like Arizona) if you rent a car and have a residence within 50 miles that they can, and will, charge you an additional $100 fee. I kid you not. 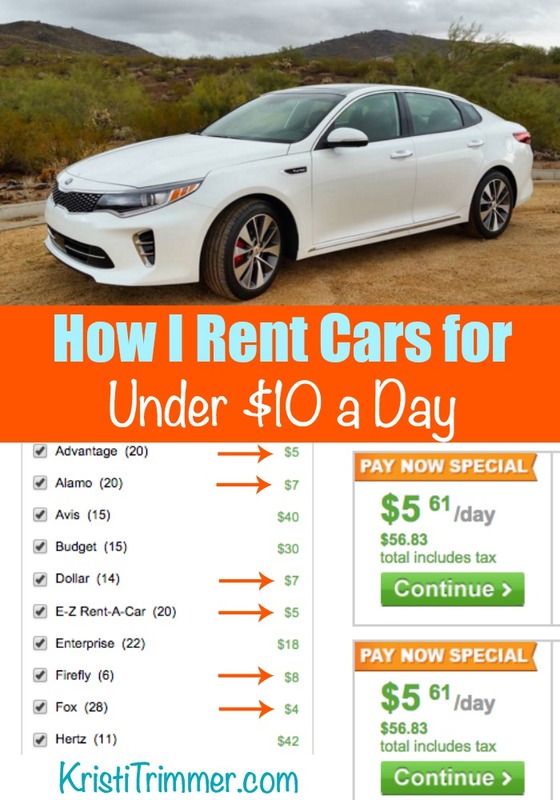 I stumbled on CarRentals.com one day as I was researching rental cars for when I was headed home to Phoenix. I was shocked to see cars coming in at $5-10 A DAY! A week’s rental would cost less than $100! I thought it was a fluke and opened up an Ingonito Window and searched again and the same prices came up. I changed the search to increase a day and the prices jumped to $15 a day. I lowered the days and the prices jumped again. I repeated this same search but on different cities. The algorithm was based on the length of rental, location, and time of year. I found that 3-5 days was the sweet spot to keep the rental under $10. Going direct to the car rental website does not usually give the same results. They have given CarRentals a certain number of cars each day to rent for super reduced prices – you just have to find them! I’ve done this with large rental companies like Alamo and smaller companies like Fox and Sixt. Make sure to check out each rental companies policies before you rent! You can reserve a car without putting down a credit card, so do that. Just note though that if you are arriving late at night that they could be out of cars. Also, if you prepay for a car making changes to that reservation is kinda impossible, but the Pay Now Special prices sometimes can’t be beat. This wasn’t a sponsored post, just my experience the last few months renting cars all over the US. Hope the info helps you to find a great deal on a car! Oh thank you!! This is such great information as we were finding rates around $200 for a day! Granted it was from an airport and to another airport, which is way more spendy. I can’t wait to look into this. Kristi I just love following your adventures! This is an awesome find. Nice.. but I’m wondering how much more it’s costing when you add insurance in the mix. A rental is no good without being insured. My insurance covers my rental cars so I’m not paying any extra. The price shown is exactly what I pay. I worked as a rental agent for many years and around year 2000 many companies changed to supply and demand just like the airlines industry. Sooooo in January in some states the rental can be very low. And in other state very high. The earliest you book the better price you get. But if there are conventions, or other things going on it can wipe out the prices in minutes. Also Enterprice, Alamo, and National is one company, and the biggest in the US. Some companies work mostly with businesses and this is the reason they are booked and more expensive. So book early especially if going to New England in the foliage season….. Or want a SUV for snowy days. Good luck. We used carrentals.com a few years ago and the price ended up being double plus car reserved was not available. They put us in upgrade then changed the price that was charged to our card. I caught it and finally got a partial refund nearly a month later. It was an off airport location too. Since then, we’ve tried to verify charges and actually got a better rate the following year at the on airport location. I have found that to be true of a lot of offsite car rental places, whether or not you use CarRentals.com. It is frustrating and I’ve jumped in an Uber and left on more than one occasion when they wanted to charge me double!